Salt water could be running down some slopes of Mars every spring, researchers suggest. Such a finding would suggest new directions to search for any life that still existed on the Red Planet. Clusters of dark, narrow lines that periodically emerge and lengthen on slopes in the warmer regions suggest briny water on Mars might still be flowing in a few rare places on the planet's surface. A great deal of evidence on the Martian surface suggests the planet was wet and perhaps capable of supporting life in the past. Although frozen water has been detected near the surface in many middle-to-high latitudes, there has been no definitive evidence that liquid water still runs across its surface. "Water today on Mars was suggested previously, but it's not clear if those claims withstood follow-up studies," McEwen added. "That may prove true with this case as well, but for now, this is the best candidate for water today on Mars." 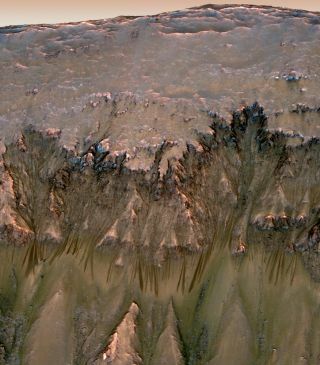 These slopes carved in Horowitz crater on Mars suggest the Red Planet might current host liquid water. Colors have been strongly enhanced to show the subtle differences, including light orange streaks (black arrows) in the upper right that may mark faded lines. The scientists discovered the strange lines after a University of Arizona student used a computer algorithm on pictures of the Martian surface taken by the High Resolution Imaging Science Experiment (HiRise) on the Mars Reconnaissance Orbiter. The algorithm was capable of identifying subtle changes on Mars over time. The images covered a variety of latitudes and span across approximately three Martian years. These finger-like streaks extend down some slopes during the warmest months of the Martian year. They fade in winter, then re-emerge in the spring. "What's most interesting to me is that it took so long to discover these details from images that were seen or acquired long ago but not examined in detail long ago," McEwen said. "It makes me wonder how many other things we're missing." These features, called "recurring slope lineae," reach down steep slopes such as the rims of impact craters, usually on sides facing the equator. While they can be hundreds of feet long, they are only about 1.6 to 16 feet (0.5 to 5 meters) wide, much narrower than gullies seen in the past on Martian slopes. The scientists detail their findings in the Aug. 5 issue of the journal Science. This composite image shows odd lines on slopes of Mars' Horowitz Crater, which scientists say suggest the presence of liquid salt water. These images show the central structure of Horowitz Crater, including central peaks and pits. The arrows mark locations of the odd slope features. Is saltwater flowing on Martian slopes? A flow started by briny water could rearrange grains or change surface roughness in a way that darkens its appearance. "The flows are not dark because of being wet," McEwen said. How these streaks brighten again when temperatures drop is harder to explain. "It's a mystery now, but I think it's a solvable mystery with further observations and experiments," he said. As to what the source of this water might be, "that is the $10,000 question," McEwen said. "It probably has to come from vapor, either from the atmosphere or from subsurface ground ice, or it's coming from brines in the crust that are stable over geological time. But it's all speculation right now — we wish we knew." This map of Mars shows relative locations of three types of findings related to salt or frozen water, plus a new type of finding that may be related to both salt and water. Blue boxes are caches of water ice; white boxes are fresh craters that exposed water ice; red boxes are salt deposits that may be from salt water evaporation. When it comes to looking for extant life on Mars, "researchers mostly have thought about the deep subsurface, but the cost and difficulty of bringing a drill rig to Mars is not really feasible," McEwen said. "However, if there is extant life on Mars, it might be accessible in these brines, which gives us a new direction as to where to go." Still, "we've been trying to come up with alternate ideas, maybe some sort of dry avalanching process, but none of them work," McEwen said. "Why does this only seem to happen at certain temperatures and latitudes, and why darken and fade? Briny water seems to be the most viable explanation for these observations so far." McEwen added that the ExoMars mission from NASA and the European Space Agency, planned for launch in 2016, is aimed to detect trace gases in the Martian atmosphere, including water, and might see whether these features really are caused by brines. "It could look for local enrichment of water and see if it corresponds to the times and places of these streaks," he said. Follow SPACE.com contributor Charles Q. Choi on Twitter @cqchoi. Visit SPACE.com for the latest in space science and exploration news on Twitter @Spacedotcomand on Facebook.